As with all Estée Lauder products, the name is a bit of a mouthful, but for all that, welcome to Mondays with MontyC's impressions of this reformulated Perfectionist [CP+R] Wrinkle Lifting/Firming Serum. 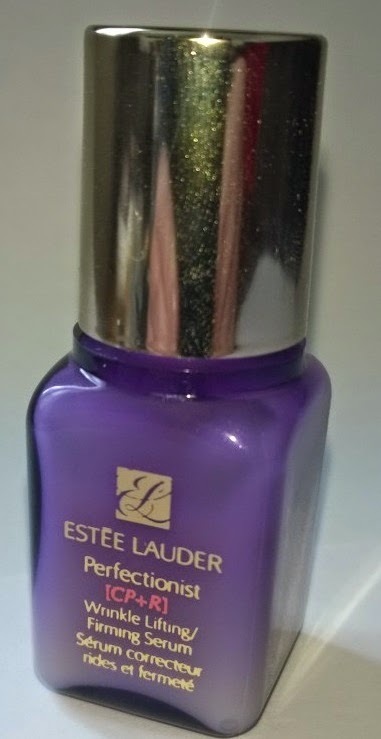 There seems to be a trend Estée Lauder of late as they've gone back to the drawing board not only with this serum but also with their iconic Advanced Night Repair Serum. This is very much a case of the "accidental review". While in Brown Thomas the other evening as my friend was getting her makeup done at the Bobbi Brown counter, I went over to the Estée Lauder counter to ask about the advanced night repair serum and to cut a long story short, I came away not only with a sample of the ANR but also samples of this serum and a few samples of one of their moisturisers (more to follow on that too). I'd heard of this serum but knew very little about and have never used it before so was intrigued to give a go. This is a daytime serum, used as per usual, before your day cream. The serum itself is a soft, creamy consistency. It sinks into my skin really easily. Personally I'm a fan of the creamier end of the consistency scale for serums, but if you prefer a lighter more fluid consistency then you may not enjoy the feel of this. It does have the signature Estée Lauder product scent to it but it's very light and fades quickly. This powerful anti-wrinkle serum is proven to significantly reduce the appearance of lines and wrinkles with exceptional speed. Supercharge the look of your skin. Fast. Effective. With innovative CPR-75 Technology. Instantly, skin feels smooth, looks fresher, younger. Our most effective wrinkle-fighting serum ever. At the time of writing, I've been using this serum every morning for four days and in that short space of time, it has impressed me. My skin looks and feels clean and fresh with an even tone but the one thing that has really blown me away is how soft and smooth my skin is. Like a baby's bottom. After four days use. Son of a biscuit. A good biscuit. Makeup looks gorgeous over it and glides on easily over the skin so it makes a pretty decent primer too. I can see why they recommend it as a daytime serum. Ingredients-wise, silicones and silica feature highly on the listing, which is likely at least partly the "why" behind my super-silky skin, and following with a huge volume of Really Good Stuff (fruit, root and leaf extracts), which is partly the "why" behind my super-soft skin. I'm delighted I discovered this, personally, although I should also point out that it also contains wheat and fish extracts, so it won't suit coeliac sufferers or vegetarians. With those caveats in mind, personally recommended.